Yokogawa continues to strengthen its presence both in Saudi Arabia and across the Middle East and Africa through active investment in both technological innovation and the development of human resources to provide its range of advanced process control and instrumentation solutions to an increasing customer base. 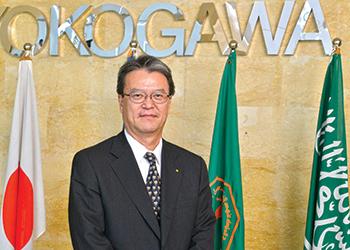 Hideki Matsubayashi, President and CEO of Yokogawa Middle East and Africa (YMA) and Yokogawa Saudi Arabia is a management board member of Yokogawa Electric Corporation, Japan. Matsubayashi was assigned to this top regional leadership position on January 1, 2015 after a decade of key assignments. Matsubayashi was previously director and senior executive vice president of engineering business in Yokogawa Middle East and Africa and Yokogawa Saudi Arabia prior to succeeding Akira Ogawa. "Saudi Arabia is our largest market regionally and globally. We operate two companies and five offices including our Dhahran headquarters, Jubail, Yanbu, Rabigh and Udhailiyah with a total of 350 employees. Our current Saudisation ratio is around 40 per cent and we are targeting around 45 per cent in near future. Yokogawa continues to develop a significant presence across the Middle East and Africa with one of the company’s five regional headquarters to provide innovative solutions for advanced process control, management information systems and industrial automation at large," says Matsubayashi. Yokogawa Saudi Arabia Company is headquartered in the Dhahran Techno Valley close to the King Fahad University of Petroleum and Minerals (KFUPM) and Saudi Aramco covering research and development, training, sales, engineering and after-sales services. Yokogawa first began operations in the Dhahran Techno Valley in March 2008 with extensive state-of-the art facilities to deliver quality-engineered solutions and provide life cycle after sales service across Saudi Arabia. The Dhahran Techno Valley is a unique and highly ambitious multi-faceted research and development bridge aimed at creating centres of excellence between the oil and gas sector, KFUPM and Saudi Aramco, which combines academic expertise with that of the world’s leading technology companies. The Dhahran Techno Valley is a key driver for advancing technological development and is implicit in the kingdom’s vision to develop a knowledge-based economy. Yokogawa has always taken a leadership position in innovation and research and development with high levels of investment and localisation through its partnerships. These capabilities in the Yokogawa Dhahran headquarters also include product and system integration as well as local manufacturing and a broad range of advanced industrial process instrumentation services, distributed control systems, plant safety systems and plant information and management systems. Yokogawa Services Saudi Arabia is a joint venture between Yokogawa Electric Corporation, Japan and GAS Arabian Services providing three major functions including training, after-sales service and E&I (electrical and instrumentation) services. 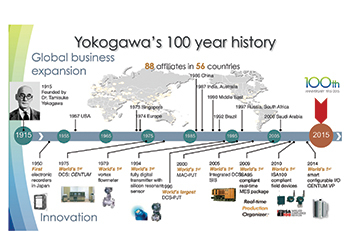 This year, Yokogawa celebrates its 100th anniversary and its core business remains process control, industrial automation and instrumentation from its global headquarters in Tokyo. In addition to oil and gas, chemical, petrochemical, refining and LNG Industries, Yokogawa also specializes in providing automated solutions for production processes in power and utilities, pharmaceuticals, mining, iron and steel production, and food and beverages. Yokogawa has five regional headquarters serving the world – the Middle East and Africa; Europe; North America and Canada; South East Asia, India and Oceania; and China. It has 88 affiliate companies spread across 56 countries with 20,000 employees worldwide. Yokogawa has secured more than 5,500 patents and registrations including the world’s first digital sensors for flow and pressure measurement. The company’s philosophy is to contribute to society through broad-ranging activities in the areas of measurement, control and information. According to Matsubayashi, Yokogawa continues to develop its innovative solutions based upon reliability and high-availability, life-cycle services and investment in human capital. "Yokogawa provides after-sales and training services for our products, engineering and installation services related to instrumentation and life-cycle support and optimisation. This includes electrical and instrumentation construction work, engineering and design, procurement and site management as well as after-sales service. This also includes configuration, testing, and is very much collaborative with our customers in the execution of the various projects to deliver top quality, cost-efficiency and reliability. In Saudi Arabia we are also harnessing the Saudi workforce by training and developing fresh graduates from leading universities and industrial colleges as well as through the collaborative programmes in the Dhahran Techno Valley," says Matsubayashi. "With the new Transformation 2017 mid-term business plan (TF2017), Yokogawa will continue to focus on the control business and will restructure its business to focus on customers, create new value and become a highly efficient global company. This is in response to changes in markets, competitors and the types of values that customers seek," he adds. Currently the YMA regional network covers 12 countries in Middle East and 54 countries in Africa through seven affiliates, 22 sales and service offices, eight engineering centres with around 1,500 employees of more than 30 nationalities. In Saudi Arabia, Yokogawa has been actively pursuing key initiatives including its contribution to Saudi Arabia’s knowledge-based economy and the transfer of knowledge to Saudi nationals. These initiatives in Yokogawa Saudi Arabia are set to maximise Saudi Arabian content; deliver high quality locally engineered solutions and services; in-kingdom research and development activities and the proactive development of Saudi human capital.